Thornes Park ParkSee the flower garden burst into colour in spring, take a ride on the miniature railway in summer, stroll amongst age-old Horse Chestnut trees in autumn and sledge down Cannonball Hill in winter. There really is something to do whatever the weather at Thornes Park. The park is located only a 15 minute walk (or 5 minute drive) from the heart of Wakefield city centre. Take a walk through the formal flower and rose gardens, discover unusual plant species in the climate controlled conservatory, say hello to the friendly birds in the aviary and feed the mallards and moorhens by the lake. Younger visitors can jump, slide and swing in the play area or improve their skate boarding tricks in the nearby skate park. Take the whole family on an adventure around the park and see if you can find the entrance to the secret garden. This small garden includes stonework dating back to 1866 along with beautiful flowers and pathways. Will you be one of the few to find the secret garden? Looking for a little more action? Improve your backhand at the tennis courts (racket hire available), practice your swing at the pitch and putt, play bowls on one of two crown greens or join in fitness activities at the Athletics Stadium. There’s plenty of green open space for you to bring your own ball games, make a day of it and bring a picnic! 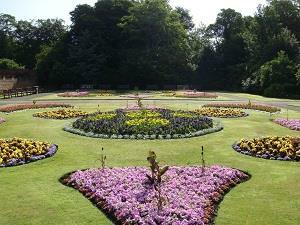 Thornes Park is part of Wakefield Park, consisting of two other parks – Clarence Park and Holmfield Park. Clarence Park is home to the historic Bandstand that plays host to music events throughout the year and Holmfield Park includes The Holmfield Eating Inn. See the flower garden burst into colour in spring, take a ride on the miniature railway in summer, stroll amongst age-old Horse Chestnut trees in autumn and sledge down Cannonball Hill in winter. There really is something to do whatever the weather at Thornes Park. Entry to the park is free. Additional charges apply for activities.